College football season has begun. I am not a huge football fan, even in college the games were more of a social event than an intense sports experience for me. I went to the same college my Grandpa went to. He and my Grandma had season tickets to the games all their lives and this became very special when I started there as well. The funny thing is I had never intended to go to this university- Mom and Dad didn’t go there and I was considering other schools. I had applied, was accepted and just decided in March of my senior year I would go. I based this on deciding one college I was considering was too close because it was in the same city as my parents and the other was in another state and too far away. This one seemed like the perfect compromise. That decision began a series of memories I could not imagine my life without. When I started college I would visit with my Grandparents before the games. When Sister K decided she also wanted to go there Mom and Dad also bought season tickets. They would come up with my grandparents and visit with us before the games. I only experienced that for one year because Sister K and I only overlapped in college for one year- I was a senior and she was a freshman. Two years ago my Grandmother passed away from Alzheimer’s and around that time Mom’s MS symptoms were making it more difficult to attend the games. So Sister K, Husband and I started going with my Grandfather. He would ride up on a bus chartered by the school or we would go home for the weekends and drive him up and back. Last football season Mom and Dad didn’t go to any games. It became too much with all of the walking and our student center was being renovated so there wasn’t a place for her to sit and watch indoors with Dad. But now our student center is finished and tomorrow we are all going to the game. Mom, Dad, Grandpa, Husband, Sister K and Me. Mom and Dad won’t go to the game but will sit inside the student center to watch. We’ll wheel Mom around in her wheelchair and she will love being back in the middle of the game day atmosphere. More than anything we will be creating new memories. The day will probably bring some challenges for us. I am sure there will be new things to learn as we navigate Mom around our college campus, figure out the best place to eat for everyone to feel most comfortable and get Mom and Dad a nice spot to sit and watch the game at…I have given it just a “little” thought. But at the same time I am excited to share this with everyone again. I am hoping I remain patient and am able to roll with any bumps in the road that may occur along the way. I am writing it here as a way to remind myself to be patient and avoid feeling overwhelmed and frustrated- to hold myself accountable. What are you plans for the weekend? Do you like college football or ever go to any football games of any kind? How do you hold yourself accountable when trying to change? A rollercoaster weekend. I am beginning to think I might slightly live a rollercoaster life. My weekend at home was filled with the highest of highs and the lowest of lows. Friday was lovely. Saturday night was tough. Sunday was a day of recovery. In that sense it was like a rollercoaster. Started out climbing the big dip, then fell down the big dip and then recovered on an easier curve. Friday Sister K set out on a mission to have a wonderful and fun day with Mom. A day in which MS is there but not the center of attention. A day in which we focus on our relationship with Mom and what it has always been instead of focusing on the stress it is under at times. We wanted to have lunch and go shopping. Thinking through this there may have been a time where we would have gone one place for lunch and another for shopping. We realized the less we had to get Mom in and out of the car the easier everything would be on her and the more relaxed she would be. So we decided to have a delicious lunch at the Neiman Marcus cafe. Sister K and I ordered mimosas to celebrate the occasion. We settled in and all referred to ourselves as “ladies who lunch.” There was fun conversation but most importantly we were having a memorable day- just Mom out with her girls. Like she has done so many times before and like we fight so hard to continue to do. After salads and dessert we headed to shop- Forever 21 and Loft. Forever 21 made me laugh. Sister K loves Forever 21. I do find good deals there on clothes but I can’t stay in there very long- the store stresses me out. But after selecting some tops/jackets to try on Sister K and I found a corner in the store that wasn’t crowded, parked Mom in her wheelchair and proceeded to try the clothes on over our own clothes. I laughed. Part of me felt embarassed. The other part of me didn’t care. That part of me said until someone comes over here and tells us otherwise we are going to continue layering on 3 layers of clothes and not going into a dressing room. With Mom’s MS we live by our own rules now and the rules we live by are all centered around what is easiest for us as far as Mom is concerned. It’s time I really begin to focus on that and not my embarrassment I am prone to at times. Then we headed to Loft. It was almost like night and day. We wandered around the store collecting clothes to try on. We had them strung on Mom as she sat in her wheelchair since we needed our hands free to push. It was another sight to see. Loft was so accomodating and gave us a huge handicap accessible dressing room. Sister K, Mom and Me in a dressing room has always been a hilarious time and this proved to be no different. It was a day of lunching and shopping. A day of doing our favorite activities we have always done but modifying them to fit our current situation and needs. I realized things are not going to be the same they were. Activities take more planning and more thought. They require more coordination in the moment. It wasn’t as stressful of a day as I think I had envisioned. I think the fact that Sister K and I were there together helped a lot. We tend to be a calming force for each other lately. But the main take away that I continue to need to be reminded of again and again: Mom is still Mom. Our mother/daughter relationship is still there. And because I know how these moments don’t come around everyday I know to cherish the memory of our “ladies who lunch” shopping day more than I might have before. In my mind it was a perfect day with Mom. A day which the puzzle pieces fit together perfectly. A day that in my heart I didn’t want to end. Have you ever shared a perfect day with someone you didn’t want to end? Do you cherish memories of these days or tend to take for granted they will happen again? Ever felt a rollercoaster of emotions in a small 3 day time period? More on that later this week. For the past few years, Dad and I have wanted to go to Sea World. We say this and then it never happens. This year I decided we were making it happen. I picked a day, I sent out an official “Save the Date” email to my family and we all had it on the calendar. Even Husband came for the day. I think halfway through he couldn’t believe he was actually at Sea World with his inlaws and no children but I know he secretly had a fun time. Regardless of it being a silly day of family fun, I was a little anxious because of Mom. We needed to rent her a scooter and the website says they are first come first served. I knew try as we might we were not going to be there at 10am when the gates opened. We run about an hour late to everything we have planned and this would be no exception. Arriving around 11 we were right on time in my family’s world. But having never done this before, I wasn’t sure how fast they went or how difficult it was to get one. 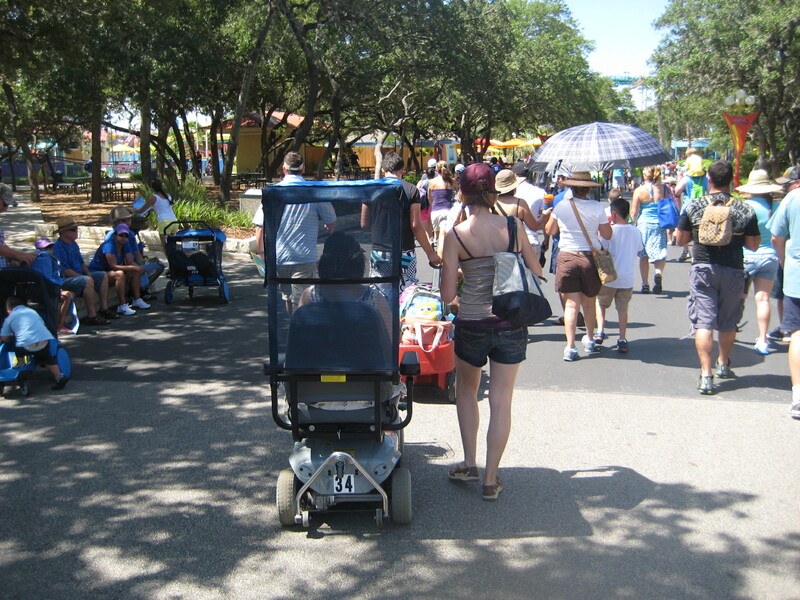 I was also nervous because of the heat and the impact it can have on Mom’s MS. We made sure Mom stayed really hydrated during the day and we paid an extra $10 and got the covered umbrella hanger above her scooter which was the best investment we could have made. 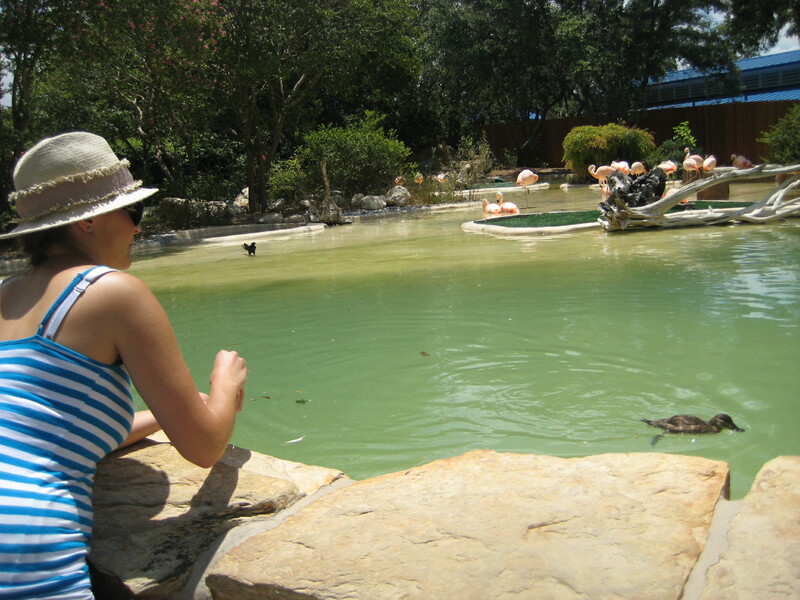 Sea World is unique in that you can stay out of the sun fairly easy. We saw every show and they are all held under covered areas. We sat in the handicap accessible seating at the top so there was also a nice breeze. We also made sure to spend lots of time inside indoor air conditioned exhibits. Mom made it the entire day and we were all so proud of her by the end of it. I think she was even amazed with herself having told us she was trying to predict beforehand how long she would last before needing someone to take her home. It was one of the most fun days my family has had this summer. It showed me that yes MS has made simple outings like this a little more challenging but we have to press on regardless. We have to keep living our life. We have to keep having our family adventures, going to different places and not just locking ourselves up at home. It requires more planning, it requires more organization and it also brings with it a lot more unknowns. These are all little things I struggle with. I am a planner and I really like to have my plan, know what’s going to happen and stick to it. I am “slowly” learning though that I am going to need to just roll with it. Roll with the changes, embrace the unexpected and just deal with it. Know going into things that there will be unexpected things that happen, changes that we can’t anticipate and get comfortable embracing this. In embracing the unexpected I am also growing as a person. How I handle Mom’s MS as we navigate the world outside of our house is teaching me how to better cope when plans don’t work out. It’s also teaching me the art of a back up plan created on the fly. 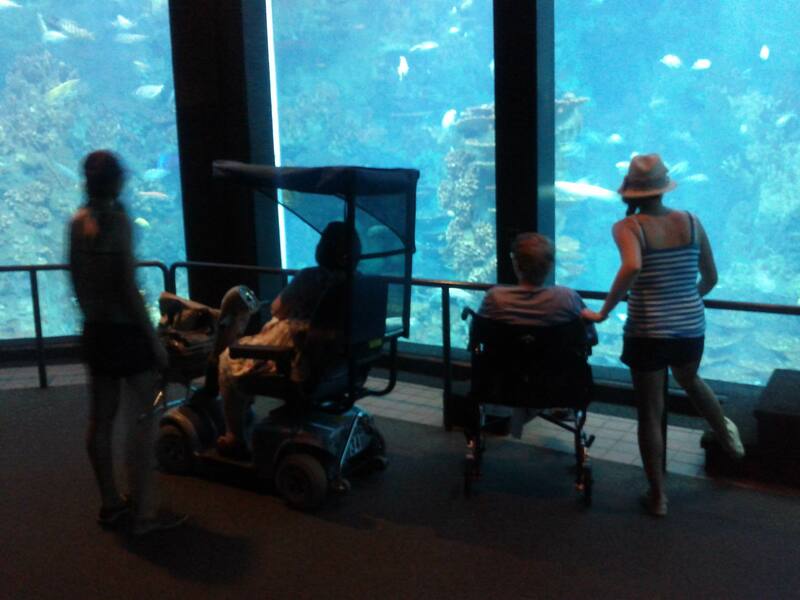 My family had such a great time at Sea World and the thought that we might not have gone because of MS taught me a big lesson. As a family we need to commit to retaining these fun moments and really enjoying them. I don’t know what tomorrow brings but I know that today brings a day of fun that needs to be cherished and embraced. Mom and Me strolling along to the Dolphins show. Check out Mom’s fancy Sea World scooter rental. These things are awesome. Dad above and Sister K below feeding the ducks. A mandatory stop for my family because of Mom’s obsession with flamingos seen in the background. 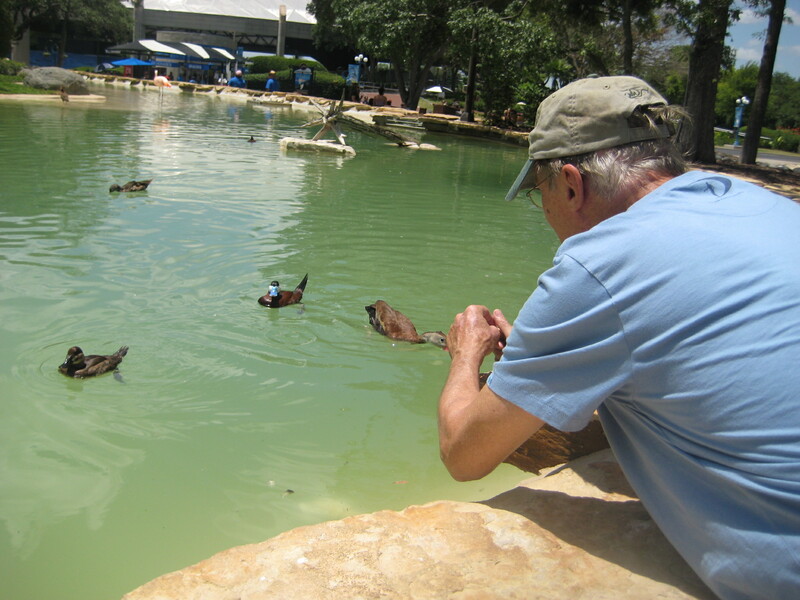 The ducks liked Dad a little more than Sister K…. 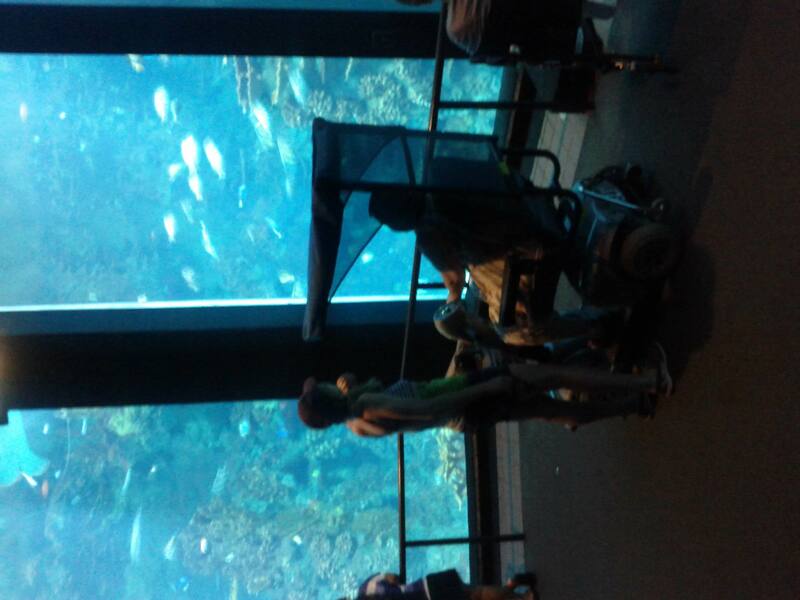 Inside the giant, air conditioned aquarium watching the fish with Mom. It was actually very relaxing. Dad has to have knee surgery in about a month because he has torn his meniscus. Becuase of this after walking around most of the day his knee was starting to bother him so we went and got Mom’s actual wheelchair (not the Sea World rental) to roll him around in. Sister K and I just had to laugh looking at both of our parents in wheelchairs. *Only person not pictured in these is Husband. He was the one responsible for taking most of these pictures. I promise he was there..even if he can’t believe it himself. How do you embrace the unexpected? Do you struggle with having no control in certain situations sometimes? Does your family enjoy silly family fun outings? When was the last time you went to Sea World? I mentioned last week my family is planning a big cruise vacation for next summer. I knew the planning would be an interesting and somewhat challenging process- I just didn’t realize it would happen so soon. There have been many decisions to be made- picking an itinerary, selecting the best cruise line, selecting accessible rooms, etc. We have never done a cruise so it is already a new experience but doing it with Mom’s MS adds another level of new to this as well. We decided to work with a travel agent who is also a family friend. This has been a lifesaver already. She knows Mom’s situation personally so I know she is personally looking out for her. She has brought up issues and ideas that I had not thought of and is working through ways to solve them. For instance we have to purchase insurance. An insurance policy that covers not only health insurance but a sort of protection since everything is prepaid in case we have to cancel our trip, lose luggage, miss our flights, etc. But you have to read the fine print. Some policies will only cover cancellations because of illness if they occurred 60 days prior and are not a pre-existing condition. If Mom has a flare up or relapse right before, some policies won’t cover it. Through our travel agent we have found a policy that meets these requirements but with a little extra cost. Check. We had to book rooms to reserve the cruise. The rooms need to not only accomodate Mom’s needs but also accomodate our family too. After searching around on the cruise layout I found an accessible room that connects to another standard room. There is only one option like this on board. The cruise line did not offer this up initially but after some extra work on my part I was able to find it. Check. Next up will be contacting a scooter assistance company. I was unaware but there are services that will drop off a scooter for Mom at the pier of the ship and pick it up at the end. Because Mom’s MS is fairly new to our family we don’t have this down to a science like I am sure many other families do. It is new to us and requires a step back and lots of thought. I am enjoying the planning but want to make sure I have everything figured out the best way for Mom. It is definitely presenting some new challenges I hadn’t thought of- at the same time it is good for me to know that I can work through these challenges and successfully find a solution. It’s empowering and makes me feel like we have control over our fight with MS when I struggle so often feeling the other way around. There have been a couple moments when I have this small worried voice inside saying “Are we taking on too much? Is this worth it?” Then I fight it back down by saying yes, yes it is. This is not only important for Mom but it is important for our family. It is our way of not only saying but showing that our life and activities will not come to a halt because of MS.
To say this will be a great learning experience is an understatement but I am looking forward to sharing what I learn with all of you. I think that’s the best way to support each other- showing how we not only deal with the challenges of MS as a family but how we overcome them. Do you ever feel overwhelmed by trying to not let MS prevent you from doing the things you and your loved ones enjoy? How do you fight through that and quiet the voice of worry inside? Thank you for reading and for your comments, they mean so much. I feel as though I have a virtual support team out there of people nodding along with my words. My family attended the Michael Jackson The Immortal World Tour by Cirque Du Soleil recently. We have always enjoyed going to shows but this was the first time we had done something like this with Mom’s MS the way it is now. Mom falls much more under the handicap accessible category than she used to and that presents new challenges for all of us. We purchased tickets in the handicap accessible seating for the first time. There were 2 tickets there and then 3 a few rows behind together. Dad dropped us off at the entrance to the venue. The handicap parking was full so he had to park elsewhere. Sister K and I got Mom inside and situated only to find the handicap bathroom stall was out of order. At this point it literally seemed like there was one thing after another. There was a moment when I saw some women in the bathroom line watching Sister K and I assist Mom into a normal stall- I was filled with envy. How easy for you to be here tonight. To walk in, find your seats and just relax and enjoy a fun-filled evening. Of course we had the exact same experience but just had a few obstacles getting to that point. I am disappointed I even had that thought at all. I have to stop comparing our situation to other people’s in moments like this. It isn’t healthy and it makes me more irrtated inside. Sister K sat with Mom during the performance. I sat in the other seats with Dad and Husband. It was easier in case Mom needed anything for Sister K to help. In the end it was a wonderful night that ended with us playing Michael Jackson songs the entire way home along with stopping for some drive through ice cream. Most importantly it was very uplifting to get Mom out of the house and go do something different with her. But it is tough. It definitely takes some effort to remain active as a family with Mom’s MS. Nothing is easy anymore and nothing is done quickly anymore. You have to anticipate and expect the unexpected and know things will most likely not run smoothly. Plus we are new to the phrase handicap accessible. New to knowing what our rights are, what we can demand, etc. For instance when we realized the handicap stall was broken we were told we could use the family restroom. There was a line for it but later after waiting in the line we were told we have priority. Now we know. 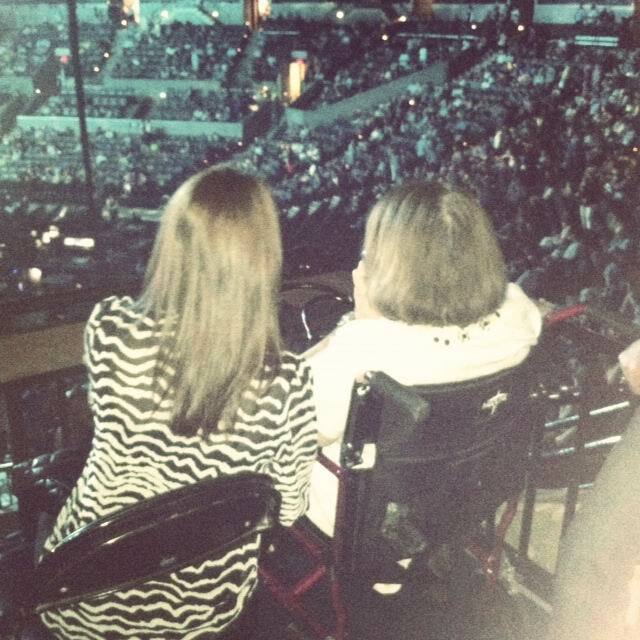 We also now understand how handicap accessible seats work at an arena. (They are great by the way. I was really impressed.) Everytime we do something like this we learn new tricks which make next time easier. It is hard though because it requires me to be very “go with the flow,” to adapt quickly to any changes and not let it bother me. I have said it over and over on here- I am a planner. “Go with the flow” is hard for me. These situations also require me to fight urges to get stressed or uneasy and keep things calm and steady for Mom. I know she watches closely for my reaction in certain situations. I think she knows I am the first to break if there is something to really be stressed about. I wear my emotions on my face. Sometimes that is a positive but sometimes it is a real negative. My family has made a committment to not passing up opportunities like this because Mom has MS, even though it may be more difficult on us. These moments and memories are as important for Mom as they are for us. They change things up, they are a break from her same routine and they get us all out of our comfort zone. I think in many ways conquering nights like these teaches me a lesson too. Just because you may encounter one minor setback doesn’t mean a domino effect of setbacks is about to occur. It is teaching me to keep my cool, to think quickly and calmly under pressure and to just live in the moment. Focus on Mom and focus on the fun. I need to tell any axiety inside to Beat It. How do you react when you are stressed? How do you handle minor setbacks when you are in a situation where you have little control? Do you believe it is important to not let MS control our lives and continue doing the activities we want to do? Have you seen the Michael Jackson Immortal Tour?